Windy City Banner: Movie Review- 'The Avengers'- So, When's the Sequel? 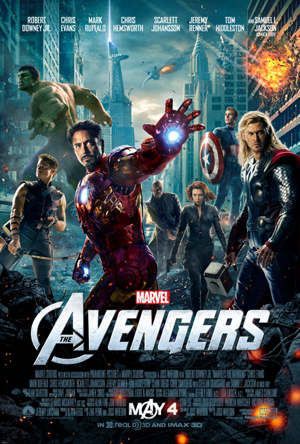 Movie Review- 'The Avengers'- So, When's the Sequel? Windy City Banner couldn’t have been more excited when Marvel’s The Avengers was released May 4th, and for good reason. The movie was at the top of the box office list, generated millions of dollars, and hardly produced any negative criticism. I couldn’t wait to see it and enjoyed every minute of it. Go grab your tickets, popcorn, and gather up your friends to see why this movie was such a hit. Director Joss Whedon certainly has a way with making his films captivating and bringing to life his characters and showing us why we love the movies. Known for his work with Buffy the Vampire Slayer, Firefly and other geek excitement, including his work within comics, he brought The Avengers, which is based on the comic series, to a whole different level. The Avengers is a superhero team brought together by Nick Fury, head of the peacekeeping agency S.H.I.E.L.D. Our heroes include Iron Man, The Incredible Hulk, Thor, Captain America, Hawkeye and Black Widow. The newest enemy, Loki, stirs up trouble and threatens global safety and security and it’s up to the Avengers to stop him. Loki (Tom Hiddleston) has stolen a cosmic cube with potent powers that can be used as a portal to space and he plans to use it and enslave the human race. The plot is solid, simple and easy to follow which is always a thumbs-up. Even though it was two and a half hours almost, it was nice we didn’t spend half of it in their agency offices looking at fancy computers and listening to swanky technology dialogue and getting lost in their battle plan like many movies in this genre sometimes do. So, it’s hard to really say anything negative about this film, except maybe in the middle it could have picked up a bit, but I never found myself frustrated with the plot. The cast was unbeatable. It included Robert Downey Jr. (Iron Man), Chris Evans (Captain America), Mark Ruffalo (The Hulk), Chris Hemsworth (Thor), Scarlett Johansson (Black Widow), Jeremy Renner (Hawkeye), and Samuel L. Jackson (Nick Fury). There was action, there was humor, and there was Hemsworth showing off his muscles and Johansson always in a tight something. They even perfected The Hulk to look like Ruffalo. The special effects were striking and there was so much exciting action and plot turns that I was on the edge of my seat the whole time. And of course, everyone will enjoy Robert Downey Jr.’s comical one-liners to relieve a little tension with his team. I must admit, I saw it in 2D. And I think it was the best choice. There didn’t seem to be anything in the movie that would be dazzling in 3D. The 3D might take away from trying to enjoy the film. The graphics, special effects, and the alien armies trying to take over the world, were so interesting all on their own. This comic book-movie was so impressive that the talks of a sequel are stirring about and they’ve definitely set it up for one. But, could it be just as successful? Here’s to hoping!